The Tineco A11 has a long list of features that you might not expect to find on a relatively unknown brand. The filtration is fully sealed with a HEPA filter to trap the vast majority of dust particles that travel through. This is an important feature on any vacuum that is designed for carpets so it is nice to see Tineco putting some thought into this. One unique twist on this is the filter is not washable but can be thoroughly cleaned via their included tool. It’s a quick process that is easy and doesn’t require waiting hours for it to dry before you can continue vacuuming. The A11 comes in 2 different models: the Hero and Master. The Master is the higher end (and more expensive) of the two vacuums with the biggest difference being attachments and brushes. The Master actually comes with two LED brushes to suit the different floors around your home. Both come with the Multi-Tasker power brush which works great on carpeting but the Master also gets the Soft-Roller brushroll for attracting fine particles on hard surfaces. We’ll get into more of the features as we compare it with the V10 in each category below, but this overview shows you that Tineco did indeed bring some serious competition to this cordless comparison. 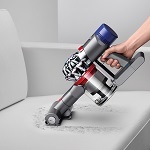 The powerful V10 from Dyson is their flagship cordless vacuum that provides entire household cleaning without being tethered to an electric outlet. It too has a sealed HEPA filtration system to go along with ultra powerful suction that can handle as much as other full sized (corded) uprights can. Dyson has long been known for innovation and really pushing the boundaries of technology and the V10 is the result of many years of refinement. It now stands at the top of their robust cord-free lineup. The V10 is offered in the Motorhead, Animal, and Absolute configurations. They are all very similar but come with different cleaning heads to suit the types of floors you have in your home. The Motorhead uses their direct drive head for smoother floors while the other two can handle carpets as well. All have powerful suction and lithium ion batteries that last for quite a while on a full charge. So it’s pretty obvious that the Tineco and the Dyson have a lot to offer but what are their differences? And is one a better choice? Let’s get into our side by side comparison to find out. The picture above clearly demonstrates just how similar these two cordless vacuums look. Both are slim with a lightweight overall design, sporting large power floor heads for deep cleaning carpets. They also will both convert to handheld mode to clean other ‘above the floor’ surfaces like furniture and bedding. A variety of attachments can help with this as well. From looking at them side by side it’s easy to see that Tineco took their design cues from Dyson, which makes sense given their success in the industry. It should be obvious to anyone researching vacuum cleaners that high quality filtration is very important, especially for those who suffer from asthma or indoor allergies. It’s been proven that HEPA filters are important for eliminating allergens so you only want to compare vacuums that have one if you are using it for cleaning your entire household. Both the Tineco A11 and Dyson V10 have HEPA filters as well as fully sealed systems. This means that no dirt can escape once they are inside the air pathways. There is no place for tiny dust particles to go except into the collection bin or filter. The filtration systems are both high quality on these cordless vacuums but cleaning the filter is a different process. The Dyson V10 requires you to remove the filter and rinse it under water until it is clean. This only takes a few minutes but you then must let it completely air dry before you can put it back into the machine. The filter must be completely dry before you can use the vacuum so the best time to do this is right when you are finished for the night. The Tineco A11 on the other hand has a really innovative way to get the filter clean. It comes with a special tool that takes less than a minute to completely clean the filter, allowing you to quickly commence vacuuming again. No water and very little effort are required to keep the suction power at a high level. Here is a very brief demonstration of how this process works so you can see just how simple it is. Kudos to Tineco for innovation and really thinking ‘outside the box’. When you think of cordless vacuums you don’t typically consider suction power as a key quality. This is because they have historically been nothing more than glorified powered dusters mainly meant for quick pick-ups. However, the A11 and V10 aren’t your typical cord-free models as they are made for whole household cleaning of all surfaces including carpeting. 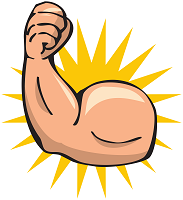 This means that power is a very important consideration when you are comparing different brands and models. As far as overall power rating the Dyson V10 has a slight edge at the maximum setting. Both of these vacuums have a Max Mode and the V10 is rated at around 150 air watts of power. This is even more than some full sized corded uprights which is impressive to say the least. The Tineco A11 is rated slightly lower at around 120 air watts but this is still quite good for a cordless offering. On regular mode they are very similar in terms of suction power. This is perfect for smooth floors and area rugs, and even lower pile carpets. Max setting is only needed for deep cleaning rugs so you won’t be using it often but when push comes to shove the Dyson V10 will give you just a little bit more. Lithium Ion batteries are the single biggest improvement made on cordless vacuum cleaners over at least the past several years and likely longer. The Dyson V10 comes with a 7 cell battery pack that they claim gives you about 60 minutes of runtime on their lowest power setting. We have found this is inflated but you can still expect about 45 minutes or so under normal conditions. Bump the suction up to max and the time goes down quickly, but this is to be expected. Our biggest complaint with the setup on the Dyson is the battery is integrated and not removable so you have to shut the vacuum off to charge it. Which brings us to the Tineco A11. Both the Hero and Master models come with 2 lithium ion battery packs that are removable for charging at any time. This is very handy as you can charge one while using the other. They claim you get about 60 minutes of runtime on normal power mode via the 2 battery packs and this is mostly accurate. However, since you can keep charging one while you are using the second you can really keep cleaning for extended periods. Plus you could always buy additional batteries should the need arise. 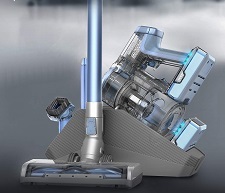 This is a pretty big advantage over the V10 and we aren’t quite sure why Dyson doesn’t have this feature. Kudos to Tineco for considering what homeowners would like most out of their cordless batteries. Handheld operating mode is a crucial trait for any lightweight cordless stick vacuum cleaner sold today. Since you are free from the restrictions of a corded model, it is really helpful to be able to remove the extension wand and attach a cleaning tool. Operating the vacuum in this mode lets you clean furniture, bedding, car upholstery, and other hard to reach places that you could never reach with an upright. It’s honestly one of the best features on cordless vacuums and both the A11 and V10 can be used like this. They both either come with or have available for purchase some of the standard attachments you would expect like crevice tools, dusting brushes, and pet hair removers (mini spinning brush tools). 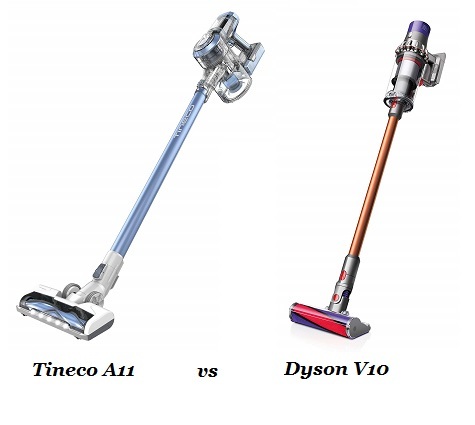 Now it comes down to the buying decision of the Tineco A11 or Dyson V10 cordless vacuum. By now it is obvious that they are compared quite favorably to one another. The Dyson will cost a bit more but you are getting a longer track record from a company that is well known throughout the world. The V10 is very maneuverable, powerful, and has excellent filtration for removing allergens from your home. Click here to check pricing on this popular model. The Tineco A11 is a relatively unknown “new kid on the block”. However, when you look at the features you can quickly see that it is every bit as good as the V10. It’s also cheaper to buy and you get those removable batteries for longer cleaning sessions. When you read other consumer reviews for any of their vacuums you will notice a lot of praise and high ratings. It’s definitely worth a look, and if you are ready to price it out click here to visit our recommended supplier.